I really really really LOVE Sarah's work, her paper dolls are my favorite. So I was super psyched when she agreed to give us a peek at how one of her lovely ladies come to life. Enjoy! Want more Sarah? Go check out her blog at ohkirby.blogspot.com and her second shop kirbyvintage.etsy.com - she admits to having a slight obsession with hoarding vintage finds and owning this shop is sort of like therapy! 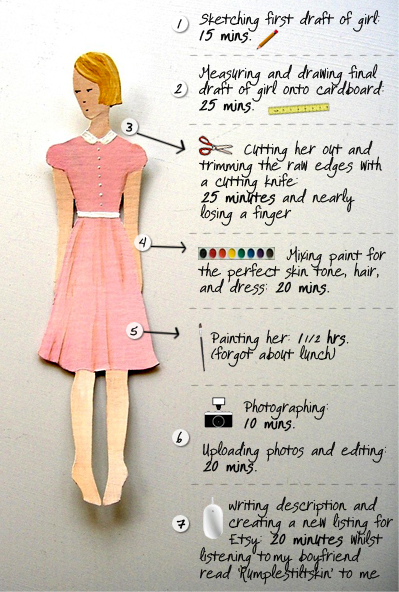 Even a paper doll takes ao much time and effort, nice to learn the facts! These are just lovely, thank you for introducing me to another sweet etsy shop! Melissa: I love her stuff, I used to love playing with paperdolls when I was little ... whatever happened to them?? star of the east: i know! I love writing up the Heart Labs, they're so much fun and I'm always amazed!